Hit everyone. I'm Lightining Wolf. Thanks for checkinbg out my profile and please check out my drawings, images, and others things. Let my tell you a little about myself. I'm christian (I love you God and thank you) and love being it, I also enjoy drawing, writing, reading, movies, my favorite TV shows (but I don't watch alot), games, and others. I also love wolves, werewolves, vampires, cats, dogs, and hamsters. I also enjoy Fred and the Annoying Orange. My birthday is Feb. 17 1997. Check out and see if we have anything in common. Coraline, 2010 Alice and Wonderland, How to Train Your Dragon, Percy Jackson, Bolt, Fred the movie, Fred 2, Balto, Balto 2, The Smurfs, New Moon, Eclipse (don"t like the first or last), Harry Potter 1, 2, 3, 4, 5, 6, 7 part 1 and part 2. 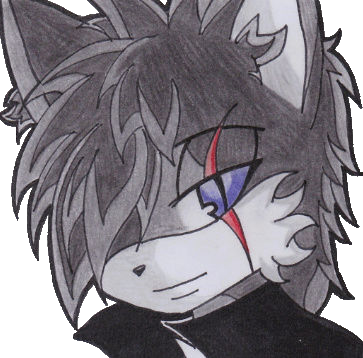 Say, is your icon/avatar maybe, Max, from the monga serious Maximum Ride? Say Harry Potter and the Smurfs a month ago. Loved them both.....Love Harry Potter, loved the smurfs movie. Thanks Lightening! I love the image you did of Blue, it`s amazing!